Is it OK to Torrent Without a VPN? Learn How to Use Anonymous Payment Methods to Purchase Products and Services Online Anonymously. WAIT! Please see our newer, more up-to-date post on the same topic » ‘Anonymous Online Payments Explained: How to Pay Anonymously‘. To be truly anonymous online means learning how to pay for services and products in some cases without revealing any private information about yourself. At Cogipas, we tout many free and open source privacy tools and techniques, but there are some occasions when you have to pay for good privacy protection. Any leading premium privacy service – whether a top VPN, privacy cleaning app, password manager, secure email or Usenet provider – will not keep logs of their users’ activities (a good thing). But to be truly anonymous, you should also not provide your real name, email or any other personally identifiable information (“PII”) even to these types of services. In fact, given the prevalence of identity theft and mass scale data breaches these days, the less personal information you provide to any third parties, the better. Large corporations are having their databases and customer information hacked a dime a dozen. Maximizing your protection means paying and signing up for those services and products with providers that accept gift cards, Bitcoin or some other way of making privacy-enhanced or “anonymous” payments. Most people may not need such a high level of privacy all the time, but if you do, keep reading to learn how to make private and anonymous payments. You need to be aware that the benefits offered by a number of privacy services can quickly unravel. Any adversary tracing activities back to your service provider(s) or app vendor could uncover your identity because they (sometimes by law) will have your personal information data on file such as your name, address, email, phone number as well as your payment information, usually your credit card or PayPal details. It is important that you understand this. Many people don't catch the inherent contradiction of signing up for an “anonymity” service or tool and in the very next step provide personal information as part of the signing up, subscribing or buying process. This means finding ways to sign-up and pay for services and products without disclosing your identity or any personally identifiable information that can be traced back to you. This is where anonymous payment methods come in very handy. Anonymous payments are possible but not easy, especially due to efforts to reduce money laundering and tax evasion as well as due to banking regulations in the wake of 9/11. The options can be grouped as follows and each is examined in detail below. The most feasible anonymous payment methods include prepaid gift cards (heading #1) and Bitcoin (heading #3). (As you'll read, Bitcoin isn't 100% anonymous but it protects your identity pretty well). In-between, we include a discussion about using an anonymous email address (heading #2) because many payments and sign-ups will require an email address, so staying anonymous in these cases takes an additional step or two. Using prepaid credit cards is somewhat helpful but these are only private and not anonymous. Similarly, some third party solutions are available for private, but again not anonymous, payments. Prepaid gift cards are generally the best and easiest way to make anonymous payments. They're widely available and you can buy them in person with cash. For example, some of the online privacy protection services we love to recommend, such as Private Internet Access VPN, accept payment by major brand gift cards, including Starbucks, Best Buy, Target, Macy’s, Walmart and dozens of other gift cards. Top Tip – To subscribe to PIA VPN with any of 100+ gift cards, select ‘Get VPN Access‘ under the heading ‘Pay anonymously with many major brand gift cards‘. For example, a $25.00 Starbucks gift card will get you 100 days of VPN access. By paying with a prepaid gift card you do not need to reveal any personal information and your identity is not revealed, even to the service provider. If you need an email address – for example, to receive a username and password – use an anonymous email address (discussed at #2 below). When buying the gift cards you intend to use for anonymous payments, it’s important to use cash as this means no bank or credit card is involved in any part of the transaction that can be traced back to you. For ultimate security, you should also purchase these gift cards at an establishment that doesn't have security cameras. Using prepaid gift cards is also quite straightforward and easier than Bitcoin (Bitcoin is discussed at #3 below). One minor disadvantage of prepaid gift cards is that a small balance that is too tiny to spend may remain on the card. In such cases, donate what’s left to a worthy charity. Top Tip – Although it is far better for your privacy to buy gift cards in person with cash, if you need one quickly, many gift cards can be purchased online and delivered instantly via email, including e-gift cards at Walmart and Target. For any email delivery, use a single purpose, one-off or disposable email address while your true IP address is hidden (discussed next). Many online payments and most sign-ups require a working email address. Obviously, using your personal everyday email address for this purpose breaks any chance of remaining anonymous. That’s why you always have to use an anonymous email account for any anonymous payments requiring an email address. It’s actually quite easy. A single purpose email address is one you sign up for with disinformation (fake details) and use only for the purpose of your anonymous payment(s). A single purpose email address has the advantage of your personal everyday account: your messages are saved and archived and you can access them for further reference if needed. The point is to use this email account only for this purpose and not for any other purpose. You can also use a one-time or disposable email address. These are handy, but will not save or archive your old messages. Which to use will depend on your needs. If you need a more permanent account – for example to receive notifications, files or updates by email – a single purpose email account may be better. For either method, you want to make sure your true IP address is not stamped on any email server logs, so always use either method above with Tor browser (The Onion Router) or a reliable VPN enabled. You could also access it from an Internet café that accepts cash payments and doesn’t have security cameras. Basically, you want to mask your true IP address whenever accessing your anonymous email account to cut off the possibility of your identity being traced through the server logs of the email provider. Top Tip – What's Tor? It's a free and easy way to browse the web while hiding your true IP address. never use this email for any other purpose. Don’t mix your anonymous and non-anonymous activities! A lot of confusing jargon is used when describing how to use Bitcoin for online payments. Once the steps are explained, you will realize Bitcoin payments are actually convenient as well as privacy-enhancing. Bitcoin also has other advantages such as having no intermediary fees in contrast to the hefty charges by credit cards and banking cards. Bitcoin is not a tangible form of currency, instead it is a crypto currency. It is a virtual currency that is increasingly accepted for online payments. It is a decentralized form of open source virtual currency based on peer-to-peer technology somewhat similar to BitTorrent file-sharing technology. You can use Bitcoins to purchase online anonymously goods and services such as a VPN, secure email, software apps, Usenet newsgroups access and much more. You can even exchange Bitcoins for other currencies. Unlike state controlled banks for traditional money, there is no regulatory body (yet) that controls the flow of Bitcoins. The value (exchange rate) of Bitcoins fluctuate based on supply and demand. Bitcoins are created virtually through an algorithm that creates them at a certain rate depending on the amount of processing power dedicated to creating them. You can even “mine” Bitcoins but we won't go into that here. Well, the answer is yes and no. Bitcoin is a private payment method but, contrary to popular belief, it is not truly 100% anonymous. Strictly speaking, Bitcoin payments can be traced through the chain of transactions that remain stamped on the currency. Each Bitcoin keeps a record of the transactions it was used in, called a “block chain”, which includes IP address information from these transactions. While there are methods for “cleaning” Bitcoins to make them nearly anonymous, these methods are complicated. For example, there are ways to prevent any true linkage between the block chains and your identity by creating a so-called anonymous Bitcoin wallet, but the efforts required are rather onerous and prone to errors and only worth pursuing by people with the need for ultimate anonymity such as whistleblowers, activists, witness protection, stalked celebrities etc. Bitcoin is quasi-anonymous in nature because, at some point, a verified bank account has to be used somewhere along the line in the process to acquire, dispose or exchange Bitcoins. Although it is possible to acquire Bitcoins without a bank account, the steps involved add further hassle and relying on (yet more) third parties which may or may not be reliable and trustworthy. When all is said and done, Bitcoin is fine as a very private payment method for most people and purposes. Bitcoin is widely accepted and although technically its transactions can be traced, it is reasonable enough for making “anonymous” payments. Making payments with Bitcoin is straightforward once you get the hang of it. Most leading privacy services and tools now accept Bitcoin as a payment method. Top Tip – Most leading VPN providers, including PrivateInternetAccess, happily accept Bitcoin payments. Before making a purchase online anonymously with Bitcoin, you will need to set up your Bitcoin “wallet” (basically, the app you use to send and receive Bitcoins). Then, you will need to initially fund it. When purchasing an online service or product, simply select Bitcoin as your payment method and you will be presented with a Bitcoin wallet address. To make a payment, simply copy and paste the recipient’s (vendor’s) Bitcoin address and enter the amount to pay in your Bitcoin wallet. Or, if you are using a mobile Bitcoin wallet, scan the QR code. You can check your Bitcoin wallet at any time to view your transactions. In just seconds, you will receive a notification confirming the payment. You can complete the rest of the sign-up and setup process (remember to use your anonymous email address if one is needed at any step rather than your true email) and start using the service or product without worrying about your activities being easily traced back to you through the transaction. Privacy is starting to become big business, especially in the wake of increased public awareness, in large part thanks to Edward Snowden’s revelations. Some third parties, including major credit card brands, are starting to offer privacy-enhanced payment methods to meet the demands of customers. Make no mistake: these are not anonymous payment methods and are hardly perfect private payment methods either as the merchants will have some pieces of your true identity on file. That’s because pre-paid credit cards will need to have some verified link to either your bank account or another credit card. In the chain above, anyone trying to trace activities back to you will have to jump through an extra “hoop” in the process. Most of the major credit card brands now offer prepaid versions of their cards. Prepaid credit cards can be a good private payment method when bought in person with cash, as there will be no verified name or banking details linked to the card. With a prepaid credit card, you have to pay the entire balance up front (usually plus a small fee). A prepaid credit card can be used anywhere normal credit cards are accepted, including online, and can be used until the balance is used up. As the card has no verified name linked to it, usually you can use any name you want (including a fake name) when making purchases with it. Because the card is prepaid, the company that issued the card essentially ignores the name submitted with the purchase transaction data. The links below are just for information as you should buy a prepaid credit cards in person and in cash. Most prepaid credit cards bought online need to be delivered by post to an actual address, which obviously undermines any privacy protection you were hoping to achieve. 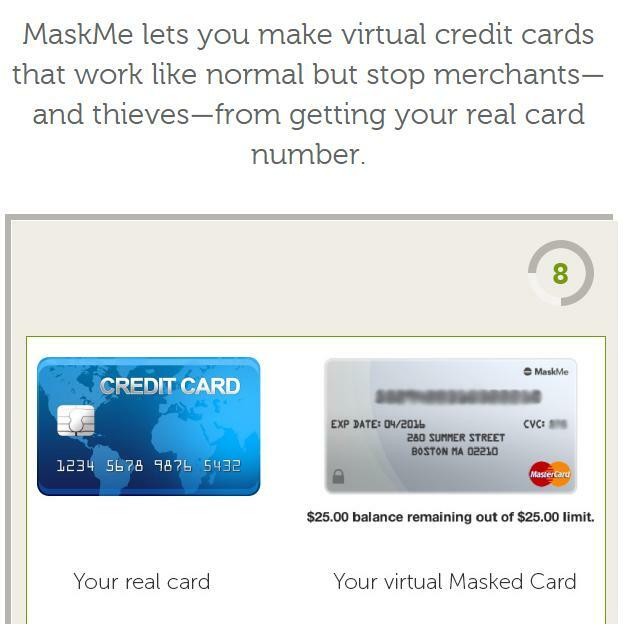 Therefore, you should buy them online only if i) the card can delivered electronically, ii) you use an anonymous email address (see #2 above ) and iii) you use an anonymous payment method (otherwise you'll have to pay with a method already linked to your identity such as PayPal or another credit card). This does seem a bit silly though because if you already have a way of paying anonymously, there is little need for you to buy a prepaid credit card online! Services, such as Entropay or MaskMe, also place an intermediary between you and the products or services you buy online. These are still relatively new services and we are watching them closely. The jury is still out about their effectiveness so we cannot quite “recommend” them just yet. Every service wants a telephone number these days. It is very odd that the article does not specifically mention this fact. To get an email address you often need a cell phone number. For a Facebook account, you now need a cell phone number. To use Web Money with anyone, you need an account with Web Money and you need to give them a cell phone number. Anonymity is quickly drying up on the internet and while I hear about excuses such as security and crime all the time, it sure seems like the real motive is control. Its not like people are being killed or brutalized by online anonymous payments. Its also rather odd and annoying to be posting a reply to an article about anonymity that demands a name and email address to post a reply. Seriously. I occasionally need to make small payments to suppliers ($40-50). I would like to make these payments without any of my personal details being known, my name, PP account, debit card number etc. Is this the type of service you offer? Cash would be a good choice, but of course is risky and subject to loss (e.g., if sent in the mail). You could also choose suppliers that accept Bitcoin and similar payment methods. In theory Bitcoin is not 100% anonymous, but unless you are engaged in matters touching on national security the level of anonymity it offers is perfectly fine. Bitcoin does have a learning curve and, as a “currency”, it can be a bit volatile. The best balance of safety and convenience for you is probably a pre-paid credit card that you buy offline (in a store) with cash. You can also do this with a gift card if your supplier is willing to accept payment in that way. That may sound weird but a service such as https://www.paygarden.com/ lets suppliers accept payment from the gift cards of other companies. • Is My VPN Working? Some of our links to external websites are affiliate links, but this never costs you anything extra and helps keep the rest of our content (200+ web pages!) free. Read our Disclosure Statement. Email is used for major announcements only. For more frequent tips & news, follow us on Facebook. © 2019 Cogipas.com. All Rights Reserved.